A postcard sent to Helen Tillie Bukowski. 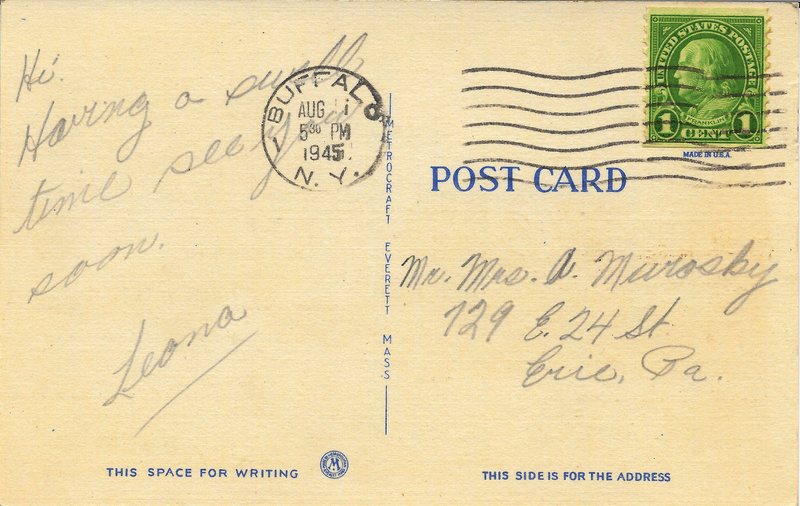 The postcard was postmarked August 1945 out of Buffalo, New York. The post card was sent by Leona Pietrzak - Helen's niece. Leona Pietrzak, the daughter of Clara Tillie Bukowski, was in Buffalo, NY visiting the family of William F. Bukowski. William Bukowski, Leona's uncle, was the brother of Helen Tillie Bukowski and Clara Tillie Bukowski. Leona would been 13 years old when she sent this postcard to to her Aunt Helen. Leona Pietrzak is my 1st Cousin 2x. Her mother Clara Tillie Bukowski is my 2nd Great Aunt. She is the sister of Helen Tillie Bukowski, my Great Grandmother. Helen's son Arthur is my paternal grandfather.